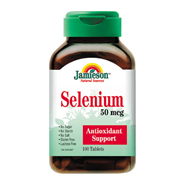 Jamieson Selenium is derived from brewer's yeast. In a published study in the American Medical Journal, a team of researchers at the Arizona Cancer Center reported that the daily intake of Selenium reduced the incidence of lung, colon, and prostate cancer. Each tablet contains: Selenium (from Brewer's Yeast) 50mcg.